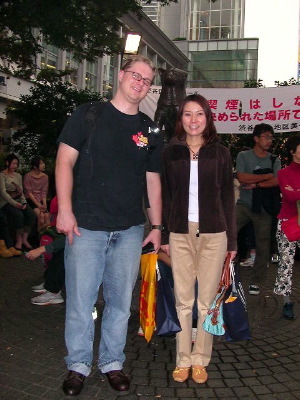 When I went to Japan in high school as part of an exchange program, Reagan Newcomb and I both stayed with Yoshiko. Now both of us have journied back to visit. I bet Reagan's Japanese is better then mine. Yoshiko was five months pregnant in this picture, she was worried cause she gained 2 kilos. In the background is a famous statue, it's not very big. It's of a very loyal dog named Hachiko.